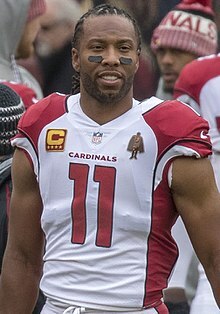 Larry Darnell Fitzgerald Jr. (born August 31, 1983) is an American football wide receiver for the Arizona Cardinals of the National Football League (NFL). He played college football at Pittsburgh, where he earned unanimous All-America honors. He was drafted by the Cardinals third overall in the 2004 NFL Draft. Fitzgerald has been selected for the Pro Bowl eleven times, and was named First-team All-Pro in 2008 and Second-team All-Pro twice in 2009 and 2011. As of November 2018[update], he is second in NFL career receiving yards, third in career receptions, and seventh in receiving touchdowns. Larry Fitzgerald attended the Academy of Holy Angels in Richfield, Minnesota during his teenage years. Fitzgerald attended the University of Pittsburgh, where he played for the Pittsburgh Panthers football team under head coach Walt Harris. He was widely considered one of the best wide receivers in college football from 2002 to 2003. In his freshman season, Fitzgerald was an instant contributor. In the second game of the season against Texas A&M, he had ten receptions for 103 yards. Three weeks later, against Toledo, he had six receptions for 121 yards and his first two collegiate touchdowns. Fitzgerald had another stellar outing against Virginia Tech on November 2. Against the Hokies, he had five receptions for 105 yards and three touchdowns. In the last regular season game of the season on November 30, he had 11 receptions for 159 yards and two touchdowns against West Virginia. Pitt finished with an 8–4 record and qualified for a bowl game. In the 2002 Insight Bowl, Fitzgerald had five receptions for 88 yards and a touchdown. Overall, in the 2002 season, Fitzgerald had a Big-East conference leading 69 receptions for 1,005 yards and twelve touchdowns. Fitzgerald had a stellar sophomore season in 2003. He began the campaign against Kent State. Against the Golden Flashes, he had six receptions for 123 yards and three touchdowns. In the next game against Ball State, he had seven receptions for 124 yards and two touchdowns. Fitzgerald once again put out a great effort in the following game against Toledo. Against the Rockets, he had 12 receptions for 201 yards and a touchdown. In the next game against Texas A&M, Fitzgerald had his fourth consecutive game with at least 100 receiving yards. Against the Aggies, he had seven receptions for 135 yards and three touchdowns. Two weeks later, against Notre Dame, he was held under 100 yards for the first time. However, he still had five receptions for 79 yards and two touchdowns. Fitzgerald bounced back in the next game against Rutgers. Against the Scarlet Knights, he had eight receptions for a season-high 207 yards and two touchdowns. Fitzgerald's hot streak continued in the next game against Syracuse, where he had eight receptions for 149 yards and two touchdowns. Fitzgerald's performance against the Orange was his fourth consecutive game with at least two touchdowns. Fitzgerald started the month of November with seven receptions for 156 yards and a touchdown against Boston College. In the following week against Virginia Tech, he had eight receptions for 108 yards and a touchdown. Fitzgerald added another great performance against West Virginia in the following week. Against the Mountaineers, he had nine receptions for 185 yards and two touchdowns. In the following week against Temple, he had seven receptions for 102 yards and two touchdowns. Fitzgerald's performance against the Owls was his sixth consecutive game with at least 100 receiving yards. Fitzgerald's impressive streak ended the following week against Miami. In the game, he had three receptions for 26 yards and a touchdown. Despite having a season-low in yardage, Fitzgerald ended up recording his 12th consecutive game with at least one touchdown reception in the 2003 season, and 18th straight game with a touchdown reception dating back to the previous season. Pitt finished with an 8–4 record in the regular season and qualified for a bowl game. In the 2003 Continental Tire Bowl, Fitzgerald had five receptions for 77 yards in the final game of his collegiate career. He was held without a touchdown for the first time in 18 collegiate games. Overall, Fitzgerald led the Big East conference with 92 receptions for 1,672 yards and 22 touchdowns in the 2003 season. The 22 touchdowns also led the NCAA in 2003. After his sophomore season, Fitzgerald was recognized as the best player in the NCAA with the 2003 Walter Camp Award and the Touchdown Club of Columbus's Chic Harley Award, and as the best wide receiver in college football with the 2003 Biletnikoff Award and the Touchdown Club's Paul Warfield Award. He was also a unanimous 2003 All-America selection and a runner-up for the prestigious Heisman Trophy, given to the most outstanding player in college football; Oklahoma's Jason White won the award that year by a relatively slim margin. In just 26 games with the Panthers, Fitzgerald caught 161 passes for 2,677 yards and set a new Pitt record with 34 receiving touchdowns. He was the first player in school history with back-to-back 1,000-yard receiving seasons, and his 14 games with at least 100 yards receiving broke Antonio Bryant's previous all-time Panthers record of 13. Fitzgerald's 18 straight games with at least one touchdown reception is a NCAA record. On July 1, 2013, Fitzgerald's #1 jersey was retired by the University of Pittsburgh. Fitzgerald was the ninth Pittsburgh player to receive this honor. Although Fitzgerald had played at Pitt for only two years without redshirting, he petitioned the NFL to allow him to enter the 2004 NFL Draft, as he had left his high school, Academy of Holy Angels, during his senior year to attend Valley Forge Military Academy. The NFL granted an exception to allow Fitzgerald to enter The Draft, as Fitzgerald had convinced the NFL that the time he spent at VFMA, combined with his time at Pitt, was the minimum three years removed from high school to make him eligible for the draft. Although former Ohio State running back Maurice Clarett was suing the NFL at the time to overturn the rule (a case Clarett initially won, but it was later overturned on appeal), the NFL considered Fitzgerald's case separate from Clarett's. After his tremendous sophomore year, Fitzgerald was drafted third overall in the 2004 NFL Draft by the Arizona Cardinals, whose then coach, Dennis Green, knew Fitzgerald from his time as a Vikings ball boy. He was the first wide receiver to be selected in the 2004 NFL Draft. In addition, he was the first of six Pitt Panthers to be selected that year. Fitzgerald made his NFL debut against the St. Louis Rams in the 2004 season opener on September 12. In the 17–10 loss, he had four receptions for 70 yards. In the fifth game of the season on October 10, he had his first career touchdown reception, a 24-yard pass from Josh McCown, against the San Francisco 49ers. On December 19, against the St. Louis Rams, Fitzgerald became the youngest player at 21 years and 110 days, to record at least two touchdown receptions in a single game. His record has since been broken by Aaron Hernandez of the New England Patriots in 2010 and Mike Evans of the Tampa Bay Buccaneers in 2014. He followed up his historic performance in the next game against the Seattle Seahawks, in which he had four receptions for 70 yards and two touchdowns. In 2004, Fitzgerald had 59 receptions for 780 yards and eight touchdowns in his rookie season as the Cardinals missed the playoffs with a 6–10 record. Fitzgerald started his second professional season with a 13-reception, 155-yard, and one-touchdown performance against the New York Giants in the season opener on September 11. Three weeks later, he had seven receptions for 102 yards against the San Francisco 49ers. He followed that good performance up with a great outing against the Carolina Panthers in the next game, where he had nine receptions for 136 yards and a touchdown. On November 13, in the ninth game of the season, Fitzgerald had eight receptions for 102 yards against the Seattle Seahawks. In the next game against the Detroit Lions, he had nine receptions for 141 yards and a touchdown. He posted his third consecutive game with at least 100 receiving yards in the next game against the St. Louis Rams. In the game, he had nine receptions for 104 yards and a touchdown. Fitzgerald started the month of December with eight receptions for 129 yards against the San Francisco 49ers. Fitzgerald closed out the regular season with a touchdown catch in each of the last three games. Fitzgerald and the Cardinals missed the playoffs with a 6–10 record. In 2005, Fitzgerald led the NFL with 103 receptions for 1,409 yards (fourth in the NFL) and 10 touchdowns (fifth in the NFL) and was named to his first Pro Bowl. Fitzgerald teamed with Anquan Boldin to create one of the most dangerous wide receiver tandems in the NFL. In 2005, Fitzgerald and Boldin became only the second tandem from the same team, the first tandem being Herman Moore and Brett Perriman of the Detroit Lions, to each catch over 100 passes top the 1,400-yard mark. Fitzgerald started his third professional season with nine receptions for 133 yards against the San Francisco 49ers. He had his first touchdown of the season in the third game against the St. Louis Rams. He sustained a hamstring injury and missed three games. He returned against the Dallas Cowboys on November 12 in a 27–10 defeat. Two weeks later, he had 11 receptions for 162 yards against the Minnesota Vikings. He closed out the 2006 season with four receiving touchdowns in the last five games. Overall, on the 2006 season, Fitzgerald recorded 69 receptions for 946 yards and six touchdowns as the Cardinals went 5–11. Fitzgerald started the 2007 season with a slow performance against the San Francisco 49ers, where he had only three receptions for 20 yards. Three games later, he had ten receptions for 120 yards against the Pittsburgh Steelers. In the next game, he had his first touchdown of the season against the St. Louis Rams in a nine-catch, 136-yard performance. On November 11, he had eight receptions for 74 yards and two touchdowns against the Detroit Lions. Two weeks later, he had nine receptions for 156 yards and two touchdowns against the San Francisco 49ers. In the regular season finale against the St. Louis Rams, he had 11 receptions for 171 yards and two touchdowns. Fitzgerald and the Cardinals finished with an 8–8 record. As part of his 2007 Pro Bowl season, Fitzgerald caught 100 receptions for 1,409 yards and 10 touchdowns. Following the 2007 season, he signed a four-year, $40 million contract extension with Arizona. While still under contract at the time, performance bonuses forced the team's hand into a massive extension. Fitzgerald's numbers earned him the nickname "Sticky Fingers" and "The Best Hands in the NFL" in local media. The 2008 season marked a huge year for Fitzgerald in terms of individual accomplishment and team success. In the season opener against the San Francisco 49ers, Fitzgerald caught a touchdown. In the second game of the season, he had six receptions for 153 yards against the Miami Dolphins. He followed that up with seven receptions for 109 yards against the Washington Redskins in the next game. He posted his third consecutive game with at least 100 receiving yards in the next game against the New York Jets with 122 receiving yards on eight receptions. In the next game, he was held to only 52 yards, but had two receiving touchdowns in a 41–17 victory over the Buffalo Bills. On November 16, Fitzgerald had ten receptions for 151 yards against the Seattle Seahawks. On November 27, he had his second multi-touchdown game of the season, this time in a 65-yard performance against the Philadelphia Eagles. Fitzgerald finished the regular season strong with three receptions for 101 yards and a touchdown against the New England Patriots and five receptions for 130 yards and two touchdowns against the Seattle Seahawks. Fitzgerald finished the regular season with 96 receptions for 1,431 yards and a league-leading 12 touchdowns. For the first time in Fitzgerald's career, the Cardinals finished with a winning record at 9–7 and made the playoffs. In his playoff debut, Fitzgerald had six receptions for 101 yards and a touchdown in a 30–24 victory over the Atlanta Falcons in the Wild Card Round. In the Divisional Round against the Carolina Panthers, he had eight receptions for 166 yards in the 33–13 victory. During the NFC Championship for the 2008 NFL season, Fitzgerald tied a NFL record with three touchdown receptions in a playoff game. His three touchdown catches occurred in the first half; he became the first player in NFL history to accomplish that feat in a conference championship game. As a result of the 32–25 victory over the Eagles, Fitzgerald and the Cardinals represented the NFC in Super Bowl XLIII. During Super Bowl XLIII, Fitzgerald caught two touchdown passes in the game. Late in the fourth quarter, Fitzgerald had a 64-yard touchdown reception from Kurt Warner to go ahead 23–20, but the score did not hold as the Pittsburgh Steelers scored a touchdown with only 35 seconds remaining to go ahead 27–23, which was the game's final score. Fitzgerald set a single postseason record with 546 receiving yards, 30 receptions, and seven touchdown receptions, surpassing Jerry Rice's records of the 1988–89 NFL playoffs. Fitzgerald followed up his great 2008 season by catching two more touchdown passes in the 2009 Pro Bowl, earning him MVP honors. After the Pro Bowl was over, it was revealed that Fitzgerald had been playing at least the whole postseason with a broken left thumb as well as torn cartilage in the same hand. It is speculated that Fitzgerald has had this injury since November 5, 2008, when he showed up on the injury report with an injured thumb. After his record-breaking postseason, capped by his Pro Bowl MVP award, many analysts, including NFL Network's Jamie Dukes, regarded Fitzgerald as one of the best receivers in the NFL. He was named as a First-Team All Pro for the 2008 season. Coming off of a tough loss in the Super Bowl, Fitzgerald started the 2009 season with six receptions for 71 yards against the San Francisco 49ers. In the fourth game of the season, he had five receptions for 79 yards and two touchdowns against the Houston Texans. The following week, he had 13 receptions for 100 yards and a touchdown against the Seattle Seahawks. On November 8 against the Chicago Bears, he had nine receptions for 123 yards and two touchdowns. On December 6, he had eight receptions for 143 yards and a touchdown against the Minnesota Vikings. He finished out the 2009 regular season with a receiving touchdown in the last three games. Overall, he had 97 receptions for 1,092 yards and a league-leading 13 touchdowns as the Cardinals went 10–6 and returned to the playoffs. In the Wild Card Round, he had two touchdown receptions against the Green Bay Packers in a 51–45 win. However, the Cardinals were eliminated the next week by the eventual Super Bowl XLIV champion New Orleans Saints by a score of 45–14 in the Divisional Round. He was named to his third consecutive and fourth career Pro Bowl for his efforts in 2009. Fitzgerald started the 2010 season recording a touchdown against the St. Louis Rams in a 17–13 victory. He did not post any of his usual stellar results until later on in the season. On Halloween, he had six receptions for 72 yards and two touchdowns against the Tampa Bay Buccaneers. In the next game, he had his first game of the season breaking over the 100-yard mark with 107 yards on seven receptions against the Minnesota Vikings. On December 19, against the Carolina Panthers, he had nine receptions for 125 yards. In the regular season finale against the San Francisco 49ers, he had his best performance of the season with 11 receptions for 125 yards and a touchdown. Fitzgerald and the Cardinals failed to return to the playoffs with a 5–11 record. Overall, in the 2010 season, Fitzgerald caught 90 passes (5th in the NFL) for 1,137 yards and six touchdowns. After the season, he was named to his fifth Pro Bowl, and his fourth in a row. He finished ranked as the 14th best player in the league among his peers on the NFL Top 100 Players of 2011. On August 20, 2011, Fitzgerald signed an 8-year, $120 million contract with the Arizona Cardinals, tying him with Richard Seymour as the fifth highest paid player in the NFL at the time. Fitzgerald's first solid outing came against the Washington Redskins in the second game, where he had seven receptions for 133 yards and a touchdown. Two games later, he had eight receptions for 102 yards against the New York Giants. On November 13, in Week 10, he had seven receptions for 146 yards and two touchdowns against the Philadelphia Eagles. His efforts against the Eagles garnered him NFC Offensive Player of the Week honors. A few games later, he had seven receptions for 149 yards and a touchdown against the San Francisco 49ers. On Christmas Eve, he had six receptions for 105 yards and a touchdown against the Cincinnati Bengals. He closed out the regular season with nine receptions for 149 yards against the Seattle Seahawks. The Cardinals finished with an 8–8 record and missed the playoffs. Overall, Fitzgerald had another stellar season, catching 80 passes for 1,411 yards and eight touchdowns and setting a personal record of 17.6 yards per catch. Fitzgerald's accomplishments were recognized by an All-Pro second team selection as well as his sixth Pro Bowl selection. He finished ranked as the seventh best player in the league among his peers on the NFL Top 100 Players of 2012 list. Fitzgerald started the 2012 season with four receptions for 63 yards against the Seattle Seahawks. Two weeks later, he had his first touchdown of the season in a 27–6 victory over the Philadelphia Eagles. In the game, he had nine receptions for 114 yards to go with the touchdown and earned NFC Offensive Player of the Week honors. On November 4, he scored his last touchdown of the season against the Green Bay Packers in a six-catch, 74-yard performance. In the penultimate game of the regular season against the Chicago Bears, he had eight receptions for 111 yards. Overall, on the season, Fitzgerald had 71 receptions for 798 yards and four touchdowns as the Cardinals went 5–11 and missed the playoffs. He was named to his sixth consecutive and seventh career Pro Bowl. He finished ranked 22nd by his fellow players on the NFL Top 100 Players of 2013 list. In the offseason, Fitzgerald turned 30. He started the 2013 season with eight receptions for 80 yards and two touchdowns against the St. Louis Rams. In the sixth game of the season, he recorded his first performance of the season topping 100 yards against the San Francisco 49ers. In the game, he had six receptions for 117 yards and a touchdown. On November 24, against the Indianapolis Colts, he had five receptions for 52 yards and two touchdowns. Two weeks later, Fitzgerald caught all 12 of his targets for 96 yards and a touchdown in a 30–10 victory over the Rams. In the regular season finale against the 49ers, he had six receptions for 113 yards. Overall, on the season, Fitzgerald had 82 receptions for 954 yards and ten touchdowns as the Cardinals improved to a 10–6 record from the previous season of 5–11. However, they still missed out on the playoffs. For his 2013 season, he was named to his seventh consecutive and eighth overall Pro Bowl. He finished ranked 38th by his peers on the NFL Top 100 Players of 2014 list. Fitzgerald was a stable part of the Cardinals' offense in 2014. However, the lack of stability at the quarterback position put a hindrance on the team's overall performance as four different quarterbacks saw time for the Cardinals that year. He started his 11th season in the NFL against the San Diego Chargers. In the game, he only had one reception for 22 yards. He did not have his first touchdown of the season until the fifth game of the season against the Washington Redskins, where he had six receptions for 98 yards. On October 26 against the Philadelphia Eagles, he had seven receptions for a season-high 160 yards and a touchdown to earn his third career NFC Offensive Player of the Week award. Two weeks later, he had nine receptions for 112 yards against the St. Louis Rams. 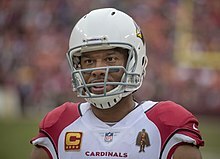 Overall, on the 2014 season, Fitzgerald had 63 receptions for 784 yards and two touchdowns as the Cardinals went 11–5 and returned to the playoffs. In the Wild Card Round against the Carolina Panthers, Fitzgerald had three receptions for 31 yards in the 27–16 defeat. He was ranked 68th by his fellow players on the NFL Top 100 Players of 2015 list. On February 18, 2015, Fitzgerald was signed to a new multi-year contract worth at least $11 million guaranteed over the next two seasons. In Week 2 against the Chicago Bears, Fitzgerald had 112 receiving yards and caught three touchdown passes, the first time he accomplished the feat during the regular season in his career. For his performance, he was named NFC Offensive Player of the Week for the fourth time in his career. In the next game, he had nine receptions for 134 yards and two touchdowns against the San Francisco 49ers. On November 15, he had ten receptions for 130 yards against the Seattle Seahawks. In Week 13, he became the youngest player to reach 1,000 career receptions; Dallas Cowboys tight end Jason Witten joined him the same day as the 11th and 12th players to reach this milestone. He closed out the 2015 regular season with a receiving touchdown in the last two games. The Cardinals finished with a 13–3 record and won the NFC West. For the 2015 season, Fitzgerald had 109 catches (tied for fifth in the NFL) for 1,215 yards and nine touchdowns. For his accomplishments during the 2015 season, Fitzgerald was selected to the Pro Bowl for the ninth time. He was ranked 27th on the NFL Top 100 Players of 2016. On January 16, 2016, Fitzgerald helped his quarterback Carson Palmer record his first playoff win with eight catches for a franchise-record 176 yards in the NFC Divisional Round against the Green Bay Packers. Fitzgerald was the Cardinals' entire offense in overtime, with a 75-yard reception to open overtime, and a five-yard touchdown reception from Palmer two plays later, which resulted in a 26–20 win. He was held to four receptions for 30 yards in the NFC Championship against the Carolina Panthers. The Cardinals' season ended with a 49–15 loss. On August 5, 2016, Fitzgerald signed a one-year, $11 million contract extension with the Cardinals. On September 11, 2016, Fitzgerald had eight receptions for 81 yards and two touchdowns, while becoming the 10th player to reach 100 career touchdowns, in the season opening loss to the New England Patriots on NBC Sunday Night Football. In the fifth game of the season, he had six receptions for 81 yards and two touchdowns against the San Francisco 49ers. On November 13, he had 12 receptions for 132 yards in another strong outing against the 49ers. In the regular season finale against the Los Angeles Rams, he had five receptions for 43 yards and scored his first receiving touchdown since the first meeting with the 49ers. The Cardinals finished with a 7–8–1 record and missed the playoffs. At the end of the 2016 season, Fitzgerald led the NFL in receptions for the second time with 107, and had 1,023 receiving yards with six receiving touchdowns. He moved from 11th to 3rd on the all-time career reception list, and ended the season ninth all-time in receiving yards. He was named to his tenth career Pro Bowl. He was ranked 45th by his peers on the NFL Top 100 Players of 2017. With the retirements of Steve Smith and Anquan Boldin at the end of 2016, the 34-year-old Fitzgerald entered the 2017 season as the career leader in receptions and receiving yards among active players. In Week 3, on Monday Night Football, Fitzgerald had 149 receiving yards on 13 receptions and a touchdown in a loss to the Dallas Cowboys, his highest output in almost three years. His 13 receptions tied Jarvis Landry in Week 2 for the most receptions in a single game in the 2017 season. The next week, he caught a 19-yard sudden death touchdown from Palmer with 0:31 left in overtime to defeat the San Francisco 49ers by a score of 18–15. In Week 6, Fitzgerald had 10 receptions for 138 yards and a touchdown against Tampa Bay, and 10 receptions for 113 yards in Week 10's Thursday Night Football loss to Seattle, joining Antonio Brown as the only players with three games of 10+ receptions in 2017, and briefly passing Brown for the league lead in receptions. On November 17, 2017, Fitzgerald signed a one-year contract extension with the Cardinals through the 2018 season. In Week 13, against the Los Angeles Rams, Fitzgerald had 10 receptions (his fourth game in double digits) for 98 yards and his fifth touchdown. In Week 16, against the New York Giants, he had nine receptions for 119 yards and a touchdown. In addition, he completed a 21-yard pass in the 23–0 victory. He tied his career-best with 109 receptions (second to Jarvis Landry), and 8th in the NFL with 1,156 receiving yards. On December 19, 2017, Fitzgerald was named to his 11th Pro Bowl. However, it was later announced that Doug Baldwin of the Seattle Seahawks would replace Fitzgerald. The Cardinals finished with an 8–8 record and missed the playoffs. In Week 1, Fitzgerald recorded seven receptions for 76 yards in a 24–6 loss to the Washington Redskins. Nursing a sore hamstring, he failed to reach 50 yards in any of his next six games, and did not record a touchdown reception until a Week 7 45–10 loss to the Denver Broncos on Thursday Night Football. In Week 8, he had eight receptions for 102 yards with a touchdown and a two-point conversion in the 18–15 victory over the San Francisco 49ers. In Week 10, in a 26–14 loss to the Kansas City Chiefs after recording six receptions for 50 yards, Fitzgerald reached 15,952 career receiving yards, passing Terrell Owens for second on the all-time list behind only Jerry Rice. In Week 11 against the Oakland Raiders, Fitzgerald made two catches for 23 yards which were both touchdowns. The Cardinals lost to the Raiders 23–21. In Week 16, Fitzgerald threw the first touchdown pass of his NFL career. After taking a lateral pass from Josh Rosen, he tossed a 32-yard pass to David Johnson for the first Cardinals score, to temporarily lead the Los Angeles Rams in the eventual 31–9 loss. In addition, Fitzgerald had six receptions for 53 yards. He finished the season as the Cardinals leading receiver with 69 receptions for a career-low 734 yards with six receiving touchdowns. On January 23, 2019, Fitzgerald announced he would return for the 2019 season, and signed a one-year contract extension with the Cardinals. First wide receiver in NFL history to record at least 150 career receptions against three different franchises (Seahawks, Rams and 49ers). Fitzgerald's father, Larry Fitzgerald Sr., is a sportswriter for the Minnesota Spokesman-Recorder. When he covered Super Bowl XLIII, he was believed to be the first reporter to cover his own son in a Super Bowl. Fitzgerald's mother, Carol, died of a brain hemorrhage while being treated for breast cancer in 2003. During the 2008 season, Larry Fitzgerald was accused of domestic violence against Angela Nazario, who filed for an order of protection against him. In 2016, Fitzgerald completed his undergraduate degree with the University of Phoenix, fulfilling a promise that he made to his mother to finish his education. Since graduation he has become a paid spokesperson for the University of Phoenix. Fitzgerald is an avid traveler and has visited nearly 100 countries worldwide. He has two sons. Fitzgerald developed a friendship with Arizona politician John McCain, and spoke at the memorial service for the U.S. senator and Presidential candidate held in Phoenix on August 30, 2018. Fitzgerald established the “Larry Fitzgerald First Down Fund” to help kids and their families by funding positive activities for kids during the summer and throughout the year, supporting kids and families in crisis and supporting health-related organizations that work with families. One initiative the “First Down Fund” holds each summer are youth football camps in Arizona and Minnesota. In May 2014, Fitzgerald and Lenovo provided five schools in Minneapolis and four schools in Phoenix Lenovo tablets and equipment to enable the children to gain access to technology. The First Down Fund made a donation to the Minneapolis Park and Recreation to help refurbish a basketball court at Rev Dr. Martin Luther King, Jr Park. The court received new hoops, poles, backboards and benches. He also partnered with Riddell to provide new helmets to 1,000 kids in the Minneapolis Parks and Recreation football program. Fitzgerald established the “Carol Fitzgerald Memorial Fund” in honor of his mother who died of breast cancer in 2003. The organization offers support to causes that Fitzgerald's mother held dear, including educating urban youth about HIV/AIDS and breast cancer issues. He has served as an NFL spokesman for the league-wide breast cancer awareness initiative “A Crucial Catch” for three years and every October makes donations to breast cancer organizations based on his touchdowns and receptions during the month. In 2014, Fitzgerald was selected as the 2014 Henry P. Iba Citizen Athlete Male Recipient, which was created in 1994 by the Rotary Club of Tulsa to recognize an influential male and female premiere athlete for their success in their sport and for being a positive role model who gives back to their communities. During the 2013 season, Fitzgerald was honored with the NFL Players Association Georgetown Lombardi Award. The award was established to honor a leader in the sports industry whose life and family have been touched by cancer, and who encourages cancer research, prevention and treatment through awareness and philanthropy. Following the 2012 football season, Fitzgerald was named the “Arizona Cardinals/Walter Payton NFL Man of the Year” and was one of three finalists for the Walter Payton NFL Man of the Year Award. In August 2012, he was honored with the 14th annual Pro Football Weekly Arthur S. Arkush Humanitarian Award for his community and charitable contributions. During the 2011, 2012, and 2014 offseasons, Fitzgerald joined other NFL players partaking in mission trips to Africa, India, Thailand and the Philippines to support economic development projects. He has worked with Starkey Hearing Foundation to provide hearing aids for children and adults in need in eight countries. Fitzgerald has also made five USO tours to visit soldiers overseas and has raised financial support for injured and critically ill members of the U.S. military. Fitzgerald was featured on the cover of the EA Sports video game NCAA Football 2005. He was also one of two players (along with Troy Polamalu) featured on the cover of Madden NFL 10, making them the first two players to be featured on a Madden NFL cover together. ^ "Larry Fitzgerald, three other Cardinals selected to 2018 NFL Pro Bowl". Arizona Sports. December 19, 2017. ^ "Larry Fitzgerald Stats". Pro-Football-Reference. Sports Reference LLC. Retrieved December 31, 2016. ^ Shook, Nick (November 11, 2018). "Larry Fitzgerald now second on all-time receiving list". NFL.com. Retrieved November 11, 2018. ^ Sommers, Kent (August 3, 2015). "Cardinals star Larry Fitzgerald lives in Arizona, but like most transplants, 'home' is somewhere else". AZ Central. Glendale, Arizona. Retrieved August 10, 2015. ^ "Walt Harris Coaching Record". Sports Reference. Retrieved August 30, 2017. ^ "Texas A&M at Pittsburgh Box Score, September 7, 2002". Sports Reference. Retrieved August 30, 2017. ^ "Toledo at Pittsburgh Box Score, September 28, 2002". Sports Reference. Retrieved August 30, 2017. ^ "Pitt at Virginia Tech Box Score, November 2, 2002". Sports Reference. Retrieved August 30, 2017. ^ "West Virginia at Pittsburgh Box Score, November 30, 2002". Sports Reference. Retrieved August 30, 2017. ^ "2002 Pitt Panthers Schedule and Results". College Football at Sports-Reference.com. Retrieved March 16, 2018. ^ "Insight Bowl - Pitt vs Oregon State Box Score, December 26, 2002". Sports Reference. Retrieved August 30, 2017. ^ "2002 Big East Conference Leaders". College Football at Sports-Reference.com. Retrieved March 16, 2018. ^ "Larry Fitzgerald 2002 Game Log". Sports Reference. Retrieved August 30, 2017. ^ "Kent State at Pittsburgh Box Score, September 6, 2003". Sports Reference. Retrieved August 30, 2017. ^ "Ball State at Pittsburgh Box Score, September 13, 2003". Sports Reference. Retrieved August 30, 2017. ^ "Pitt at Toledo Box Score, September 20, 2003". Sports Reference. Retrieved August 30, 2017. ^ "Pitt at Texas A&M Box Score, September 27, 2003". Sports Reference. Retrieved August 30, 2017. ^ "Notre Dame at Pittsburgh Box Score, October 11, 2003". Sports Reference. Retrieved August 30, 2017. ^ "Pitt at Rutgers Box Score, October 18, 2003". Sports Reference. Retrieved August 30, 2017. ^ "Syracuse at Pittsburgh Box Score, October 25, 2003". Sports Reference. Retrieved August 30, 2017. ^ "Pitt at Boston College Box Score, November 1, 2003". Sports Reference. Retrieved August 30, 2017. ^ "Virginia Tech at Pittsburgh Box Score, November 8, 2003". Sports Reference. Retrieved August 30, 2017. ^ "Pitt at West Virginia Box Score, November 15, 2003". Sports Reference. Retrieved August 30, 2017. ^ "Pitt at Temple Box Score, November 22, 2003". Sports Reference. Retrieved August 30, 2017. ^ "Miami (FL) at Pittsburgh Box Score, November 29, 2003". Sports Reference. Retrieved August 30, 2017. ^ "2003 Pitt Panthers Schedule and Results". College Football at Sports-Reference.com. Retrieved March 16, 2018. ^ "Continental Tire Bowl - Virginia vs Pittsburgh Box Score". Sports Reference. Retrieved August 30, 2017. ^ "2003 Big East Conference Leaders". College Football at Sports-Reference.com. Retrieved March 16, 2018. ^ "2003 Leaders". College Football at Sports-Reference.com. Retrieved March 16, 2018. ^ "Larry Fitzgerald 2003 Game Log". Sports Reference. Retrieved August 30, 2017. ^ "2003 Heisman Trophy Voting". Sports Reference. Retrieved August 30, 2017. ^ Fox, Ashley (January 23, 2009). "Tough love". The Columbus Dispatch. Columbus, Ohio. Archived from the original on January 21, 2013. Retrieved January 30, 2009. ^ Bernstein, Viv (December 28, 2003). "COLLEGE FOOTBALL; Virginia Defuses Fitzgerald and Pitt". New York Times. Retrieved August 30, 2017. ^ "Larry Fitzgerald Joins Legendary List of Pitt Retired Jerseys". PittsburghPanthers.com. July 1, 2013. Retrieved July 1, 2013. ^ "Larry Fitzgerald College Stats - College Football at Sports-Reference.com". College Football at Sports-Reference.com. ^ "Larry Fitzgerald". nfldraftscout.com. Retrieved September 4, 2016. ^ Simonich, Milan (February 6, 2004). "U.S. judge opens NFL to younger players, including Clarett and Fitzgerald". Pittsburgh Post-Gazette. ^ Corso, Chris. "Larry Fitzgerald Jr., From Vikings Ball Boy to NFL Wide Receiver". Minnesota Vikings. Retrieved August 30, 2017. ^ "2004 NFL Draft Listing". Pro-Football-Reference.com. Retrieved August 30, 2017. ^ "Arizona Cardinals at St. Louis Rams - September 12th, 2004". Pro-Football-Reference.com. Retrieved September 1, 2017. ^ "Arizona Cardinals at San Francisco 49ers - October 10th, 2004". Pro-Football-Reference.com. Retrieved September 1, 2017. ^ "St. Louis Rams at Arizona Cardinals - December 19th, 2004". Pro-Football-Reference.com. Retrieved September 1, 2017. ^ "Player Game Finder Query Results". Pro-Football-Reference.com. Retrieved August 30, 2017. ^ "Arizona Cardinals at Seattle Seahawks - December 26th, 2004". Pro-Football-Reference.com. Retrieved September 1, 2017. ^ "Larry Fitzgerald 2004 Game Log". Pro-Football-Reference.com. Retrieved August 30, 2017. ^ "2004 Arizona Cardinals Statistics & Players". Pro-Football-Reference.com. Retrieved March 16, 2018. ^ "Arizona Cardinals at New York Giants - September 11th, 2005". Pro-Football-Reference.com. Retrieved September 1, 2017. ^ "San Francisco 49ers at Arizona Cardinals - October 2nd, 2005". Pro-Football-Reference.com. Retrieved September 1, 2017. ^ "Carolina Panthers at Arizona Cardinals - October 9th, 2005". Pro-Football-Reference.com. Retrieved September 1, 2017. ^ "Seattle Seahawks at Arizona Cardinals - November 6th, 2005". Pro-Football-Reference.com. Retrieved September 1, 2017. ^ "Arizona Cardinals at Detroit Lions - November 13th, 2005". Pro-Football-Reference.com. Retrieved September 1, 2017. ^ "Arizona Cardinals at St. Louis Rams - November 20th, 2005". Pro-Football-Reference.com. Retrieved September 1, 2017. ^ "Arizona Cardinals at San Francisco 49ers - December 4th, 2005". Pro-Football-Reference.com. Retrieved September 1, 2017. ^ "Larry Fitzgerald 2005 Game Log". Pro-Football-Reference.com. Retrieved August 30, 2017. ^ "2005 NFL Standings & Team Stats". Pro-Football-Reference.com. Retrieved March 16, 2018. ^ "2005 NFL Receiving". Pro-Football-Reference.com. Retrieved September 1, 2017. ^ "2005 NFL Pro Bowlers". Pro-Football-Reference.com. Retrieved March 16, 2018. ^ "Profile - Larry Fitzgerald Official Site". Retrieved September 1, 2017. ^ "2005 Arizona Cardinals Statistics & Players". Pro-Football-Reference.com. Retrieved September 1, 2017. ^ "1995 Detroit Lions Statistics & Players". Pro-Football-Reference.com. Retrieved September 1, 2017. ^ "San Francisco 49ers at Arizona Cardinals - September 10th, 2006". Pro-Football-Reference.com. Retrieved September 1, 2017. ^ "St. Louis Rams at Arizona Cardinals - September 24th, 2006". Pro-Football-Reference.com. Retrieved September 1, 2017. ^ "Fitzgerald out; hamstring hurt - Tucson Citizen Morgue, Part 1 (2006-2009)". Tuscan Citizen. October 10, 2006. Archived from the original on October 11, 2014. Retrieved September 1, 2017. ^ "Dallas Cowboys at Arizona Cardinals - November 12th, 2006". Pro-Football-Reference.com. Retrieved September 1, 2017. ^ "Arizona Cardinals at Minnesota Vikings - November 26th, 2006". Pro-Football-Reference.com. Retrieved September 1, 2017. ^ "Arizona Cardinals at St. Louis Rams - December 3rd, 2006". Pro-Football-Reference.com. Retrieved January 30, 2018. ^ "Seattle Seahawks at Arizona Cardinals - December 10th, 2006". Pro-Football-Reference.com. Retrieved January 30, 2018. ^ "Arizona Cardinals at San Francisco 49ers - December 24th, 2006". Pro-Football-Reference.com. Retrieved January 30, 2018. ^ "Arizona Cardinals at San Diego Chargers - December 31st, 2006". Pro-Football-Reference.com. Retrieved January 30, 2018. ^ "Larry Fitzgerald 2006 Game Log". Pro-Football-Reference.com. Retrieved August 30, 2017. ^ "Arizona Cardinals at San Francisco 49ers - September 10th, 2007". Pro-Football-Reference.com. Retrieved September 1, 2017. ^ "Pittsburgh Steelers at Arizona Cardinals - September 30th, 2007". Pro-Football-Reference.com. Retrieved September 1, 2017. ^ "Arizona Cardinals at St. Louis Rams - October 7th, 2007". Pro-Football-Reference.com. Retrieved September 1, 2017. ^ "Detroit Lions at Arizona Cardinals - November 11th, 2007". Pro-Football-Reference.com. Retrieved September 1, 2017. ^ "San Francisco 49ers at Arizona Cardinals - November 25th, 2007". Pro-Football-Reference.com. Retrieved September 1, 2017. ^ "St. Louis Rams at Arizona Cardinals - December 30th, 2007". Pro-Football-Reference.com. Retrieved September 1, 2017. ^ "2007 Arizona Cardinals Statistics & Players". Pro-Football-Reference.com. Retrieved January 30, 2018. ^ "Larry Fitzgerald 2007 Game Log". Pro-Football-Reference.com. Retrieved August 30, 2017. ^ "2007 NFL Pro Bowlers". Pro-Football-Reference.com. Retrieved March 16, 2018. ^ "Cards, Fitzgerald agree to $40M deal". Fox Sports. March 11, 2008. Archived from the original (– Scholar search) on March 13, 2008. Retrieved March 11, 2008. ^ Cizmar, Martin (January 28, 2009). "Talking (to) trash". Phoenix New Times. Retrieved January 28, 2009. ^ "Arizona Cardinals at San Francisco 49ers - September 7th, 2008". Pro-Football-Reference.com. Retrieved September 1, 2017. ^ "Miami Dolphins at Arizona Cardinals - September 14th, 2008". Pro-Football-Reference.com. Retrieved September 1, 2017. ^ "Arizona Cardinals at Washington Redskins - September 21st, 2008". Pro-Football-Reference.com. Retrieved September 1, 2017. ^ "Arizona Cardinals at New York Jets - September 28th, 2008". Pro-Football-Reference.com. Retrieved September 1, 2017. ^ "Buffalo Bills at Arizona Cardinals - October 5th, 2008". Pro-Football-Reference.com. Retrieved September 1, 2017. ^ "Arizona Cardinals at Seattle Seahawks - November 16th, 2008". Pro-Football-Reference.com. Retrieved September 1, 2017. ^ "Arizona Cardinals at Philadelphia Eagles - November 27th, 2008". Pro-Football-Reference.com. Retrieved September 1, 2017. ^ "Arizona Cardinals at New England Patriots - December 21st, 2008". Pro-Football-Reference.com. Retrieved September 1, 2017. ^ "Seattle Seahawks at Arizona Cardinals - December 28th, 2008". Pro-Football-Reference.com. Retrieved September 1, 2017. ^ "Larry Fitzgerald 2008 Game Log". Pro-Football-Reference.com. Retrieved September 1, 2017. ^ "2008 NFL Standings & Team Stats". Pro-Football-Reference.com. Retrieved March 16, 2018. ^ "Wild Card - Atlanta Falcons at Arizona Cardinals - January 3rd, 2009". Pro-Football-Reference.com. Retrieved September 1, 2017. ^ "Divisional Round - Arizona Cardinals at Carolina Panthers - January 10th, 2009". Pro-Football-Reference.com. Retrieved September 1, 2017. ^ "Larry Fitzgerald catches 3 TDs, Cardinals lead NFC title game over Eagles 24–6 after half". Kdrv.com. Archived from the original on July 13, 2011. Retrieved September 20, 2010. ^ "Fitzgerald shines as Warner leads Cardinals to franchise's first Super Bowl". ESPN.com. January 18, 2009. Retrieved September 20, 2010. ^ Warner throws for 4 TDs, Cards stun Eagles 32–25. Retrieved on January 18, 2009. ^ "Super Bowl XLIII - Pittsburgh Steelers vs. Arizona Cardinals - February 1st, 2009". Pro-Football-Reference.com. Retrieved September 1, 2017. ^ "NFL Receiving Yards Single-Season Playoffs Leaders". Pro-Football-Reference.com. Retrieved September 1, 2017. ^ "NFL Receptions Single-Season Playoffs Leaders". Pro-Football-Reference.com. Retrieved September 1, 2017. ^ "NFL Receiving Touchdowns Single-Season Playoffs Leaders". Pro-Football-Reference.com. Retrieved September 1, 2017. ^ "2008 NFL Pro Bowlers". Pro-Football-Reference.com. Retrieved March 16, 2018. ^ "MVP to mend broken thumb". The Denver Post. February 9, 2009. Retrieved September 20, 2010. ^ "Super Debate: Is Fitzgerald the best receiver in the NFL?". Nfl.com. January 29, 2009. Archived from the original on April 14, 2009. Retrieved September 20, 2010. ^ Dougherty, Pete (December 14, 2010). "Without Aaron Rodgers, Green Bay Packers no better than Detroit Lions". Green Bay Press-Gazette. Archived from the original on July 12, 2012. Retrieved December 14, 2010. ^ "2008 NFL All-Pros". Pro-Football-Reference.com. Retrieved March 16, 2018. ^ "San Francisco 49ers at Arizona Cardinals - September 13th, 2009". Pro-Football-Reference.com. Retrieved September 1, 2017. ^ "Houston Texans at Arizona Cardinals - October 11th, 2009". Pro-Football-Reference.com. Retrieved September 1, 2017. ^ "Arizona Cardinals at Seattle Seahawks - October 18th, 2009". Pro-Football-Reference.com. Retrieved September 1, 2017. ^ "Arizona Cardinals at Chicago Bears - November 8th, 2009". Pro-Football-Reference.com. Retrieved September 1, 2017. ^ "Minnesota Vikings at Arizona Cardinals - December 6th, 2009". Pro-Football-Reference.com. Retrieved September 1, 2017. ^ "Arizona Cardinals at Detroit Lions - December 20th, 2009". Pro-Football-Reference.com. Retrieved January 30, 2018. ^ "St. Louis Rams at Arizona Cardinals - December 27th, 2009". Pro-Football-Reference.com. Retrieved January 30, 2018. ^ "Green Bay Packers at Arizona Cardinals - January 3rd, 2010". Pro-Football-Reference.com. Retrieved January 30, 2018. ^ "Larry Fitzgerald 2009 Game Log". Pro-Football-Reference.com. Retrieved September 1, 2017. ^ "2009 NFL Standings & Team Stats". Pro-Football-Reference.com. Retrieved March 16, 2018. ^ "Wild Card - Green Bay Packers at Arizona Cardinals - January 10th, 2010". Pro-Football-Reference.com. Retrieved September 1, 2017. ^ "Divisional Round - Arizona Cardinals at New Orleans Saints - January 16th, 2010". Pro-Football-Reference.com. Retrieved September 1, 2017. ^ "2009 NFL Pro Bowlers". Pro-Football-Reference.com. Retrieved March 16, 2018. ^ "Arizona Cardinals at St. Louis Rams - September 12th, 2010". Pro-Football-Reference.com. Retrieved September 1, 2017. ^ "Tampa Bay Buccaneers at Arizona Cardinals - October 31st, 2010". Pro-Football-Reference.com. Retrieved September 1, 2017. ^ "Arizona Cardinals at Minnesota Vikings - November 7th, 2010". Pro-Football-Reference.com. Retrieved September 1, 2017. ^ "Arizona Cardinals at Carolina Panthers - December 19th, 2010". Pro-Football-Reference.com. Retrieved September 1, 2017. ^ "Arizona Cardinals at San Francisco 49ers - January 2nd, 2011". Pro-Football-Reference.com. Retrieved September 1, 2017. ^ "2010 Arizona Cardinals Statistics & Players". Pro-Football-Reference.com. Retrieved January 30, 2018. ^ "Larry Fitzgerald 2010 Game Log". Pro-Football-Reference.com. Retrieved September 1, 2017. ^ "2010 NFL Pro Bowlers". Pro-Football-Reference.com. Retrieved March 16, 2018. ^ "Top 100: Larry Fitzgerald". NFL.com. Retrieved March 16, 2018. ^ Jackson, Scott. "Larry Fitzgerald Gets Paid". Bleacher Bum Sports. Retrieved March 16, 2018. ^ "Arizona Cardinals at Washington Redskins - September 18th, 2011". Pro-Football-Reference.com. Retrieved September 1, 2017. ^ "New York Giants at Arizona Cardinals - October 2nd, 2011". Pro-Football-Reference.com. Retrieved September 1, 2017. ^ "Arizona Cardinals at Philadelphia Eagles - November 13th, 2011". Pro-Football-Reference.com. Retrieved September 1, 2017. ^ "2011 NFL Week 10 Leaders & Scores". Pro-Football-Reference.com. Retrieved March 16, 2018. ^ "San Francisco 49ers at Arizona Cardinals - December 11th, 2011". Pro-Football-Reference.com. Retrieved September 1, 2017. ^ "Arizona Cardinals at Cincinnati Bengals - December 24th, 2011". Pro-Football-Reference.com. Retrieved September 1, 2017. ^ "Seattle Seahawks at Arizona Cardinals - January 1st, 2012". Pro-Football-Reference.com. Retrieved September 1, 2017. ^ "2011 Arizona Cardinals Statistics & Players". Pro-Football-Reference.com. Retrieved January 30, 2018. ^ "Larry Fitzgerald 2011 Game Log". Pro-Football-Reference.com. Retrieved September 1, 2017. ^ "2011 NFL Pro Bowlers". Pro-Football-Reference.com. Retrieved March 16, 2018. ^ "'The Top 100: Players of 2012': Larry Fitzgerald". NFL.com. Retrieved March 16, 2018. ^ "Seattle Seahawks at Arizona Cardinals - September 9th, 2012". Pro-Football-Reference.com. Retrieved September 1, 2017. ^ "Philadelphia Eagles at Arizona Cardinals - September 23rd, 2012". Pro-Football-Reference.com. Retrieved September 1, 2017. ^ "2012 NFL Week 3 Leaders & Scores". Pro-Football-Reference.com. Retrieved March 16, 2018. ^ "Arizona Cardinals at Green Bay Packers - November 4th, 2012". Pro-Football-Reference.com. Retrieved September 1, 2017. ^ "Chicago Bears at Arizona Cardinals - December 23rd, 2012". Pro-Football-Reference.com. Retrieved September 1, 2017. ^ "Larry Fitzgerald 2012 Game Log". Pro-Football-Reference.com. Retrieved August 30, 2017. ^ "2012 NFL Standings & Team Stats". Pro-Football-Reference.com. Retrieved March 16, 2018. ^ "2012 NFL Pro Bowlers". Pro-Football-Reference.com. Retrieved March 16, 2018. ^ "'Top 100 Players of 2013': Larry Fitzgerald". NFL.com. Retrieved March 16, 2018. ^ "Arizona Cardinals at St. Louis Rams - September 8th, 2013". Pro-Football-Reference.com. Retrieved September 1, 2017. ^ "Arizona Cardinals at San Francisco 49ers - October 13th, 2013". Pro-Football-Reference.com. Retrieved September 1, 2017. ^ "Indianapolis Colts at Arizona Cardinals - November 24th, 2013". Pro-Football-Reference.com. Retrieved September 1, 2017. ^ "St. Louis Rams at Arizona Cardinals - December 8th, 2013". Pro-Football-Reference.com. Retrieved September 1, 2017. ^ "San Francisco 49ers at Arizona Cardinals - December 29th, 2013". Pro-Football-Reference.com. Retrieved September 1, 2017. ^ "Larry Fitzgerald 2013 Game Log". Pro-Football-Reference.com. Retrieved August 30, 2017. ^ "2013 NFL Pro Bowlers". Pro-Football-Reference.com. Retrieved March 16, 2018. ^ "'Top 100 Players of 2014': Larry Fitzgerald". NFL.com. Retrieved March 16, 2018. ^ "2014 Arizona Cardinals Statistics & Players". Pro-Football-Reference.com. Retrieved March 16, 2018. ^ "San Diego Chargers at Arizona Cardinals - September 8th, 2014". Pro-Football-Reference.com. Retrieved September 1, 2017. ^ "Washington Redskins at Arizona Cardinals - October 12th, 2014". Pro-Football-Reference.com. Retrieved September 1, 2017. ^ "Philadelphia Eagles at Arizona Cardinals - October 26th, 2014". Pro-Football-Reference.com. Retrieved September 1, 2017. ^ "2014 NFL Week 8 Leaders & Scores". Pro-Football-Reference.com. Retrieved March 16, 2018. ^ "St. Louis Rams at Arizona Cardinals - November 9th, 2014". Pro-Football-Reference.com. Retrieved September 1, 2017. ^ "Larry Fitzgerald 2014 Game Log". Pro-Football-Reference.com. Retrieved August 30, 2017. ^ "2014 NFL Standings & Team Stats". Pro-Football-Reference.com. Retrieved March 16, 2018. ^ "Wild Card - Arizona Cardinals at Carolina Panthers - January 3rd, 2015". Pro-Football-Reference.com. Retrieved September 1, 2017. ^ NFL (May 27, 2015). "'Top 100 Players of 2015': No. 68 Larry Fitzgerald". NFL.com. Retrieved March 16, 2018. ^ Alper, Josh. "New Larry Fitzgerald deal creates nearly $13 million in cap space". ProFootballTalk. Retrieved September 22, 2015. ^ Mayer, Larry (September 20, 2015). "Bears struggle in all phases in defeat". Chicago Bears. Archived from the original on September 26, 2015. Retrieved September 25, 2015. ^ "2015 NFL Week 2 Leaders & Scores". Pro-Football-Reference.com. Retrieved March 16, 2018. ^ "San Francisco 49ers at Arizona Cardinals - September 27th, 2015". Pro-Football-Reference.com. Retrieved September 1, 2017. ^ "Arizona Cardinals at Seattle Seahawks - November 15th, 2015". Pro-Football-Reference.com. Retrieved September 1, 2017. ^ King, Peter. "1K man Fitzgerald reflects on catch No. 1". SI.com. Retrieved November 10, 2017. ^ "Green Bay Packers at Arizona Cardinals - December 27th, 2015". Pro-Football-Reference.com. Retrieved January 30, 2018. ^ "Seattle Seahawks at Arizona Cardinals - January 3rd, 2016". Pro-Football-Reference.com. Retrieved January 30, 2018. ^ "2015 Arizona Cardinals Statistics & Players". Pro-Football-Reference.com. Retrieved March 16, 2018. ^ "2015 NFL Receiving". Pro-Football-Reference.com. Retrieved August 24, 2017. ^ "Larry Fitzgerald 2015 Game Log". Pro-Football-Reference.com. Retrieved August 30, 2017. ^ "Larry Fitzgerald". Yahoo Sports. Retrieved January 16, 2016. ^ "2015 NFL Pro Bowlers". Pro-Football-Reference.com. Retrieved March 16, 2018. ^ "'Top 100 Players of 2016': No. 27 Larry Fitzgerald". NFL.com. ^ "Divisional Round - Green Bay Packers at Arizona Cardinals - January 16th, 2016". Pro-Football-Reference.com. Retrieved September 1, 2017. ^ Chase, Chris (January 17, 2016). "How the Cardinals survived the Packers in the craziest playoff game of the century". For The Win. Retrieved November 15, 2017. ^ "NFC Championship - Arizona Cardinals at Carolina Panthers - January 24th, 2016". Pro-Football-Reference.com. Retrieved September 1, 2017. ^ Wesseling, Chris (August 5, 2016). "Carson Palmer, Larry Fitzgerald sign 1-year extensions". NFL.com. Retrieved August 6, 2016. ^ "New England Patriots at Arizona Cardinals - September 11th, 2016". Pro-Football-Reference.com. Retrieved September 1, 2017. ^ a b "NFL Receiving Touchdowns Career Leaders - Pro-Football-Reference.com". Pro-Football-Reference.com. ^ "Arizona Cardinals at San Francisco 49ers - October 6th, 2016". Pro-Football-Reference.com. Retrieved September 1, 2017. ^ "San Francisco 49ers at Arizona Cardinals - November 13th, 2016". Pro-Football-Reference.com. Retrieved September 1, 2017. ^ "Arizona Cardinals at Los Angeles Rams - January 1st, 2017". Pro-Football-Reference.com. Retrieved September 1, 2017. ^ "2016 Arizona Cardinals Statistics & Players". Pro-Football-Reference.com. Retrieved March 16, 2018. ^ "2016 NFL Standings & Team Stats". Pro-Football-Reference.com. Retrieved March 16, 2018. ^ "2016 NFL Receiving". Pro-Football-Reference.com. Retrieved August 30, 2017. ^ "NFL Career Receiving Yards Leaders Through 2016 - Pro-Football-Reference.com". Pro-Football-Reference.com. ^ "2016 NFL Pro Bowlers". Pro-Football-Reference.com. Retrieved March 16, 2018. ^ "Top 100 Players of 2017': No. 45 Larry Fitzgerald". NFL.com. ^ a b c d "Larry Fitzgerald Career Game Log - Pro-Football-Reference.com". Pro-Football-Reference.com. ^ "Miami Dolphins at Los Angeles Chargers - September 17th, 2017". Pro-Football-Reference.com. Retrieved October 28, 2017. ^ "Most receptions, single game, 2017 season". Pro-Football-Reference.com. Retrieved January 31, 2018. ^ "Player Game Finder Query Results - Pro-Football-Reference.com". Pro-Football-Reference.com. ^ Knoblauch, Austin. "Larry Fitzgerald signs one-year contract extension". NFL. Retrieved November 17, 2017. ^ "New York Giants at Arizona Cardinals - December 24th, 2017". Pro-Football-Reference.com. Retrieved January 30, 2018. ^ "2017 NFL Pro Bowlers". Pro-Football-Reference.com. Retrieved March 16, 2018. ^ "Doug Baldwin replaces Larry Fitzgerald on Pro Bowl roster". USA TODAY. Associated Press. January 4, 2018. Retrieved January 30, 2018. ^ "2017 NFL Standings & Team Stats". Pro-Football-Reference.com. Retrieved March 16, 2018. ^ Moore, Greg. "Cardinals' Sam Bradford has plenty of reasons for confidence â€" even against Rams defense". azcentral. Retrieved January 24, 2019. ^ "Larry Fitzgerald 2018 Game Log (Games 2–6)". Pro-Football-Reference.com. Retrieved January 24, 2019. ^ Baum, Bob (October 19, 2018). "Lots of Broncos fans on hand to watch rout of Cardinals". WNCT. Retrieved January 24, 2019. ^ Odegard, Kyle (November 11, 2018). "Larry Fitzgerald Moves To Second All-Time In Receiving Yards". AZCardinals.com. ^ Cox, Seth (December 23, 2018). "Larry Fitzgerald throws for touchdown, as Arizona Cardinals lose 31-9 to Los Angeles Rams". Revenge of the Birds. Retrieved January 24, 2019. ^ "2018 Arizona Cardinals Statistics & Players". Pro-Football-Reference.com. Retrieved January 24, 2019. ^ Urban, Darren (January 23, 2019). "Larry Fitzgerald Decides To Play In 2019". AZCardinals.com. ^ "Larry Fitzgerald: Career Stats at NFL.com". www.nfl.com. Retrieved October 22, 2018. ^ "Seasons with 90+ receptions". Pro-Football-Reference.com. ^ "Seasons with 100+ receptions". Pro-Football-Reference.com. ^ "NFL Receiving Touchdowns Single-Season Playoffs Leaders". Pro-Football-Reference.com. Retrieved March 18, 2019. ^ "NFL Receptions Single-Season Playoffs Leaders". Pro-Football-Reference.com. Retrieved March 18, 2019. ^ "NFL Receiving Yards Single-Season Playoffs Leaders". Pro-Football-Reference.com. Retrieved March 18, 2019. ^ "NFL Receptions Career Leaders - Pro-Football-Reference.com". Pro-Football-Reference.com. ^ "NFL Receiving Yards Career Leaders - Pro-Football-Reference.com". Pro-Football-Reference.com. ^ "Cardinals shut down Larry Fitzgerald because of hamstring strain". azcentral. Retrieved March 18, 2019. ^ "NFL Receiving Touchdowns Career Playoffs Leaders - Pro-Football-Reference.com". Pro-Football-Reference.com. ^ "At 32, Larry Fitzgerald embraces change in Arizona, wants to return to Super Bowl". Pittsburgh Post-Gazette. Retrieved March 18, 2019. ^ "Youngest to reach 8,000 receiving yards, career". Pro-Football-Reference.com. ^ "Fitzgerald second-fastest ever to 10,000 yards". MN Spokesman-Recorder. October 17, 2012. Retrieved March 18, 2019. ^ Worley, Brandon (November 24, 2013). "Larry Fitzgerald reaches career milestone". SBNation.com. Retrieved March 18, 2019. ^ "Fitzgerald catches 700th pass". FOX Sports. Retrieved March 18, 2019. ^ "Falcons vs. Cardinals - Game Recap - October 27, 2013 - ESPN". ESPN.com. Retrieved September 22, 2015. ^ "Arizona Cardinals' Larry Fitzgerald becomes youngest NFL player to reach 900 receptions". Arizona Sports. December 11, 2014. Retrieved March 18, 2019. ^ "Cards' Fitzgerald youngest WR to 1,000 catches". ESPN.com. December 7, 2015. Retrieved March 18, 2019. ^ Wesseling, Chris. "Seahawks overcome key injuries to defeat Cardinals". nfl.com. Retrieved November 9, 2017. ^ "Chicago/St. Louis/Arizona Cardinals Career Receiving Leaders". Pro-Football-Reference.com. Retrieved December 5, 2018. ^ "Chicago/St. Louis/Arizona Cardinals Single-Season Receiving Leaders". Pro-Football-Reference.com. Retrieved December 5, 2018. ^ a b "Chicago/St. Louis/Arizona Cardinals Single-season Receiving Leaders - Pro-Football-Reference.com". Pro-Football-Reference.com. Retrieved September 22, 2015. ^ Reilly, Rick (January 21, 2009). "Larry Fitzgerald Sr.'s toughest assignment yet". ESPN.com. Retrieved March 18, 2019. ^ McDonald, Soraya Nadia. "From Larry Fitzgerald to Jonathan Dwyer: What's changed in the way media covers domestic violence in the NFL". Washington Post. Retrieved March 7, 2019. ^ Fitzgerald also has a younger brother, Marcus Fitzgerald, who was a wide receiver for the Sacramento Mountain Lions of the United Football League. ^ Korenyi-Both, Jack. "Larry Fitzgerald: Much More than an NFL Player". The Hub. Retrieved November 13, 2017. ^ "Larry Fitzgerald Gets His College Degree". azcardinals.com. May 17, 2016. Archived from the original on August 16, 2017. Retrieved September 15, 2016. ^ "Larry Fitzgerald: Playing for the future". phoenix.edu. September 15, 2016. Retrieved September 15, 2016. ^ Root, Jess (March 22, 2017). "Larry Fitzgerald has traveled to nearly 100 countries". Cards Wire. Retrieved August 16, 2017. ^ "Protection order filed against Larry Fitzgerald Jr". Star Tribune. December 31, 2008. Retrieved September 22, 2015. ^ "First Down Fund". larryfitzgerald.com. June 16, 2014. Retrieved March 18, 2019. ^ a b c Holbrook, Mike (August 13, 2012). "Fitzgerald wins Humanitarian Award". Pro Football Weekly. Archived from the original on October 17, 2012. ^ "Lenovo and the NFL star Larry Fitzgerald team up to enhance technology in the classrooms". Lenovo. May 2, 2014. Retrieved March 18, 2019. ^ a b c Scoggins, Chip (October 20, 2012). "Chip Scoggins: Fitzgerald's philanthropy work touch lives globally". Star Tribune. Retrieved March 18, 2019. ^ a b "2014 – Male Recipient Larry Fitzgerald". Rotary Club of Tulsa. June 16, 2012. Archived from the original on August 25, 2014. ^ Lee, Kevin (April 27, 2008). "Fitzgerald & Polamalu On Madden NFL 2010 Cover". GamerCenterOnline. Archived from the original on June 15, 2009. Retrieved April 27, 2009.